A 164-metre long tapestry stitched by Scots all over the globe has gone on show for the first time in the little Zeeland town of Veere. The tapestry is made up of 305 panels and includes contributions from hundreds of embroiderers in 34 different countries. It reflects the Scottish diaspora around the globe and will return to Scotland in 2017, when it will go on permanent display in Prestonpans in East Lothian. Veere’s wealth stems from its position as a major port in the wool trade with Scotland, dating back to the 15th century. The Schotse Huizen were lived in by Scotland’s Lord Conservator who oversaw the wool trade until the end of the 18th century. So close were the ties between the two towns that in 1444 local nobleman Wolfert VI van Borselen even married Mary Stewart, daughter of King James I of Scotland. 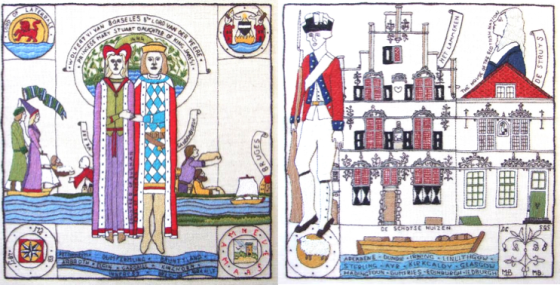 The tapestry is on show at the Scottish Houses museum in Veere until July 26.